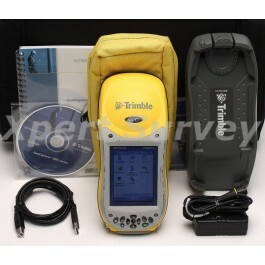 The GeoXT™ handheld, from Trimble’s GeoExplorer® series, is the essential tool for maintaining your GIS. A high performance, submeter GPS receiver combined with a rugged handheld computer, the GeoXT handheld is ideal for use by utility companies, local government organizations, federal agencies, or anyone managing assets or mapping critical infrastructure who needs accurate data to do the job right—the first time. Delivering consistent submeter accuracy both real-time and postprocessed, the GeoXT handheld is the most dependable submeter solution available. And it’s specifically designed with your GIS in mind. The GeoXT handheld is optimized to provide the reliable, high-accuracy location data when and where you need it. With advanced features like EVEREST™ multipath rejection technology, the GeoXT handheld outputs quality GPS positions even under canopy, in urban canyons, and in all the everyday environments you work in. If you need submeter accuracy in real time, you can use corrections from a satellite-based augmentation system (SBAS) like WAAS or EGNOS, or use the integrated Bluetooth® radio to connect to a Trimble® GeoBeacon™ receiver. And if you need that extra edge in precision, you can collect data with Trimble TerraSync™ software or the GPScorrect™ extension for ESRI ArcPad software, and then postprocess back in the office. The GeoXT handheld has an integrated battery, good for a full day’s work; simply charge the battery overnight and you’re ready to go again. The GeoXT handheld will last the distance, and its rugged design can take a lot of punishment. Rain, hail, or shine, it’s built to keep working, whatever the weather throws at you. Using the built-in wireless LAN and TrimPix™technology, the GeoXT handheld can connect to a range of WiFi-capable Nikon digital cameras for automated capture of digital images. Download the TrimPix software and you have an ideal solution for easily collecting high resolution digital photos to link to your GPS positions. There’s plenty of storage space in the GeoXT handheld for all your GIS data, and with its fast processor even big graphics files load quickly. Because the GeoXT handheld runs Windows Mobile 5.0 software, all your data and applications are stored in persistent memory, so your data is completely safe. And with a Secure Digital (SD) memory card slot, you can add gigabytes of memory for all your map data. Accurate information is crucial to making informed decisions and improving the way you do business. The GeoXT delivers consistent submeter accuracy both real-time and postprocessed, so you know your GIS has the information that others can depend on to do the job right—this time, next time and every time.